At Al Sab’een Hospital in Sana’a, a doctor checks on a girl suffering from cholera. Yemen has just experienced one of the worst outbreaks of cholera in history.When Ruba was born 1000 days ago, frail and underweight, her mother, Fawzia, was already sick and malnourished. Fawzia’s husband, Mastour, was struggling to make ends meet. The war in Yemen had just escalated, but the simmering conflict had already destroyed her family’s livelihood. The chances of Ruba being born healthy and well were slim. “I did not have enough money to take Ruba’s mother to the hospital when her labour began. I could just bring a midwife from the area,” says her father, Mastour. Since the violence erupted in March 2015 more than three million children have been born in Yemen. It is the poorest country in the Middle East, and over the last 1000 days, this already fragile country has collapsed into the world’s largest humanitarian crisis. Yemen is one of the worst places in the world to be a child. It is estimated that 11.3 million children are in need of humanitarian assistance — nearly every single child in Yemen. On average, five children have been killed or injured, every day, since the conflict escalated, and around 1.8m children are acutely malnourished. Ruba has survived for her first two and a half years, but it has been a struggle. She has struggled with malaria, and typhoid. She also has thalassemia, an inherited blood disorder that leads to anaemia. Ruba’s family now survive through donations from neighbours. Mastour, still goes out with his wheelbarrow, selling whatever items he can. He often returns empty handed. Stock is low, and he doesn’t have the money to replenish his wheelbarrow with the basic goods that people in his neighbourhood would buy. He owes money to many people, and often avoids them because he cannot pay off his debts. Children bring their jerrycans to fill with drinking water. 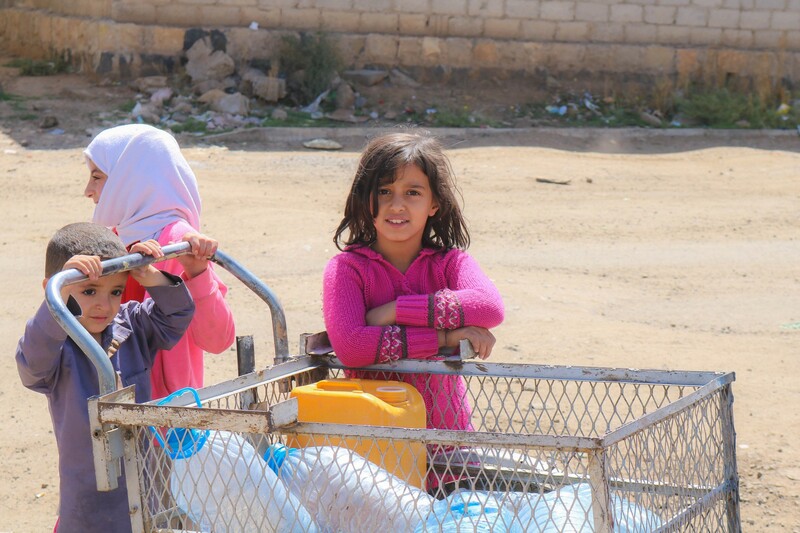 More than half of the children living in Yemen do not have access to safe drinking water. This is how the war is affecting families throughout Yemen, even those who live far from the fighting and chaos. For many struggling families, the immense financial pressure often means they feel little choice but to send children out to beg or work, or marry daughters off at a young age so that they can be cared for by someone else. After 1000 days of fighting, only 45% of Yemen’s health facilities are operational, and more than half of the country’s children don’t have access to safe drinking water or adequate sanitation. After 1000 days of fighting, only 45% of Yemen’s health facilities are operational. A devastating cholera epidemic — one of the largest in modern history — affected more than a million people last year. With the Government unable to pay its medical staff, UNICEF has started paying doctors a proportion of their monthly salary to ensure that the country’s health system — already teetering on the brink — doesn’t simply cease to exist. And poverty is spiralling. The number of Yemenis in 2016 was at least four million higher than in 2014, just before the conflict started. At the start of every day, 60% of the population doesn’t know where their next meal is coming from. A group of students sit in the shade of a tree as they listen to their teacher during a class in Al Hudaydah Governorate, Yemen. Finding safe spaces for education is a priority for UNICEF staff in Yemen. Over the last 1000 days UNICEF helped provide nearly six million people with access clean water through the operation, maintenance and rehabilitation of public water systems. Facilities, equipment and supplies have been provided so that 400,000 children can continue with their education. And a major operation to prevent the spread of cholera, and treat those affected, ensured that the death toll didn’t climb higher. Over the same period, almost 170,000 children with severe acute malnutrition were admitted for emergency feeding and care, according to Dr Shafique. Another 4.8 million children under five were vaccinated against polio. 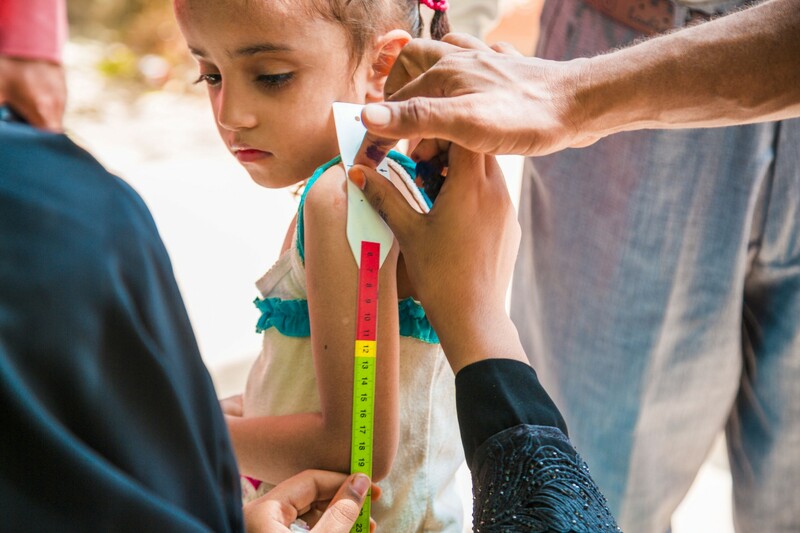 A child is assessed for signs of malnutrition by a health team going door-to-door in Lahj, Yemen. Even so, while the conflict continues, Mastour says it is children like his young daughter who will continue to suffer. 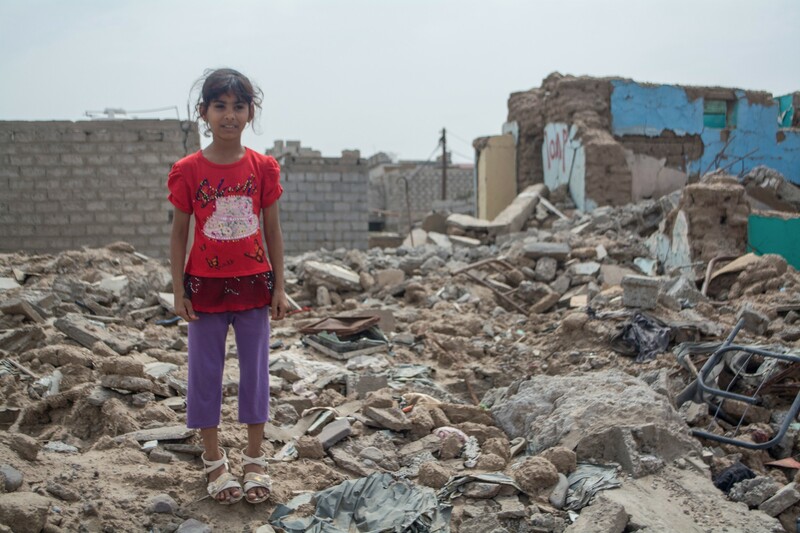 To give the children of Yemen a fighting chance, the conflict must end. Only then can children and their families hope to return to a life of normality.